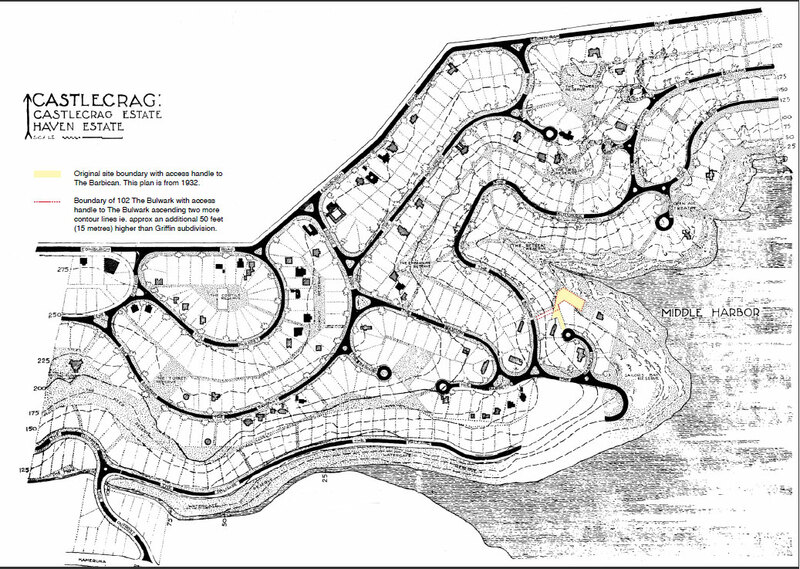 Griffin’s 1932 plan of the Castlecrag and Haven Estates. Constructed buildings are shown in black and those designed but not completed are hatched. Early European settlement on the peninsula now known as Castlecrag was by fishermen and boat builders/repairers who could access the location by water. Part of Sunnyside Estate on the north of the peninsula was the site of Australia’s first licensed radio broadcasting station, 2FC (for its owners, Farmer & Company) claimed to have the most powerful public radio transmitter in the world at this time. It commenced transmission on 5 December 1923. The transmitter was dismantled in 1929. By 1920 the remainder of the estate had been subdivided into 61 lots and the War Service Home Department was constructing 40 cottages there for returned soldiers. The suburb of Castlecrag incorporates Australia’s most significant and complete urban landscape designs and buildings by the architect Walter Burley Griffin. The GSDA land purchase from the Association of North Sydney Debenture Holders in 1920 included 92 acres in the peninsula on the south side of Edinburgh Road, which Griffin named the Castlecrag Estate as the prominent rock in what is now Tower Reserve reminded him of the ‘Castle Rock’ on which Edinburgh Castle stands. Griffin sub-divided the estate in early 1921 and construction commenced of two demonstration houses owned by the company. They were completed for the first auction sale of Castlecrag Estate lots on 26 November 1921. Four dwellings funded by GSDA shareholders in The Parapet were completed by the end of 1922. The early houses were constructed of sandstone quarried from the roads, but from 1924 several houses were constructed using knitlock roofing and wall tiles. These concrete blocks had been developed by Griffin in Canberra with assistance from David Jenkins and Malcolm Moore and were patented in 1917. The machines to make the bricks were designed by Moore and a simple factory was established in Castlecrag to manufacture the knitlock tiles. Walter and Marion Griffin moved permanently to Castlecrag in the autumn of 1925 and the following year they purchased two additional portions to the east of the Castlecrag Estate. Named The Haven Estate, this land was developed as an extension of the existing sub-division. In both the Castlecrag and The Haven Estates, the foreshore land was designated as bushland reserves. The Griffins’ vision for Castlecrag was of a community quite different from a typical Sydney suburb. The design of the roads and allotments responded to the rocky landscape with the winding roads following the contours of the landforms. Communal areas were linked together with a network of walkways and reserves to provide open spaces, retain views and achieve maximum amenity for all residents. Equally important was respect for the native Australian landscape which the Griffins had come to understand and admire. Their vision was not widely shared by Sydney home buyers and land sales languished, while only 15 of the many buildings that Griffin designed for the suburb were constructed. Road construction in the rocky terrain proved expensive and as economic conditions worsened during the decade the GSDA found itself in a difficult financial position. Nevertheless, the Griffins sought to protect the foreshore land from development by ensuring that many kilometres of Middle Harbour natural bushland foreshore was protected from building. The post-war housing boom finally saw rapid residential development in the suburb. While many of the buildings lacked sympathy with the Griffins’ concept, a number of outstanding buildings to designs by leading modern Australian architects were also built, including examples by Griffin’s partner Eric Nicholls, Hugh Buhrich, Peter Muller, Bill Lucas, Harold Smith, Harry Seidler and Alex Popov. The Castlecrag village shopping centre dates from 1924 when four shops and a residence were constructed to Walter Griffin’s design. The shops, which housed the suburb’s first baker, mercer, greengrocer and butcher, have now been incorporated into the much larger Griffin Centre. Shops on the north side of Edinburgh Road are located on the site of the former 2FC radio station transmitter, which was reserved for commercial purposes in 1928-29. All the lots were sold by 1938, but the first shops were not completed until 1941-42 and the last were opened in 1950. Village on 15 August 1978. WDHS Archives, donated by Harry Fox. Proposals for a large shopping complex on the south side of Edinburgh Road generated community opposition regarding its scale and style at the entrance to the suburb. The plans were referred to the Local Government Appeals Tribunal, which required a significant reduction in scale and The Quadrangle Shopping Village was formally opened by the Mayor of Willoughby, Alderman Noel Reidy, on 15 August 1978. In recent years the shopping village has become a popular food and wine venue, with a range of restaurants and sidewalk eating areas. The Castlecrag and Haven Estates are outstanding early examples of subdivision which respected the landscape character of an area, created community environments and provided shared views. The Griffin Conservation Area encompasses these two estates to the extent that Griffin developed his road system (The Bulwark and The Scarp) in the early 1930s. The estates are a larger more complete demonstration of principles the Griffins had developed in the United States and during their first seven years in Australia. These innovative principles involved subdivision, contoured roads embedded in the sandstone topography and engineering processes that were aimed at conserving the sandstone terrain, stream systems, indigenous bushland and harbour foreshore, and provided extensive reserves and walkways through the estates that created an integrated open space network. The estates embody the sense of community and social connection from the Griffins, the first investors and the Griffins’ friends sought a community with a strong sense of connection to the place. Long established community facilities include the Haven Amphitheatre, the Community Centre, the Griffin shops, tennis courts, reserves and walkways. The estates are unique in their application of small lots in a spectacular harbour setting with public vistas and filtered views providing the suburban ideal, though subordinated to the landscape. Castlecrag has 35 heritage listed items within its boundaries relating to early European settlement in the area, the works of Walter Burley Griffin and his partner Eric Milton Nicholls and examples of outstanding designs by modern Australian architects. One of the Hudson Homes waterfront cottages on the northern escarpment waterfront in the 1960s. Two prefabricated weatherboard Hudson Homes in the Federation style were erected on the Yachtville Estate in 1904, being located on the foreshore of the Northern Escarpment below Edinburgh Road. An ex-fisherman’s cottage and a stone cottage were added c1911. Known as the waterfront cottages, these buildings are listed as heritage items on Willoughby Council’s LEP and by the National Trust. The two Hudson Homes have been leased by council to tenants prepared to restore them under heritage standards and to install agreed effluent disposal systems. The bronze bust of Walter Burley Griffin by Judit Englert-Shead with the original Griffin-designed shops in the background. The four original shops designed by Griffin and erected in 1924 have been incorporated into the Griffin Centre located at the corner of Edinburgh Road and The Postern in the Castlecrag shopping village. They have been reconfigured for new functions and two replica shops have been added to the east, but the ovens of the original bakery till exist in the Castlecrag Cellars under the street level shops. A bronze bust of WB Griffin by sculptor Judit Englert-Shead and donated to the Castlecrag Community by the Newell Shead family was unveiled by mayor Pat Reilly in October 1997. It is located in the garden beside the footpath and serves as a starting point for guided tours of the Griffin Conservation Area. The GSDA No. 1 Dwelling photographed in the 1950s. The two Griffin-designed stone houses built by the GSDA at 136 and 140 Edinburgh Road in 1921 serve as a ‘gateway’ to the remainder of the Griffin estates. The GSDA No. 1 house served as a drawing office in the 1920s, while the No. 2 house was a residence for company officials. 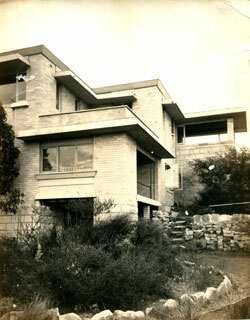 These dwellings established the essential components of the Griffin houses in Castlecrag, namely a single storey geometric form with a flat roof (No 1) or the roof hidden by a parapet, a large living room with a stone fireplace that was orientated towards the view, a small kitchen at the front of the house and subsidiary living spaces. The living room of the GSDA No. 2 house in 2008. Griffin designed a house for the intermediate block at 138 Edinburgh Road, but it was never completed. After the GSDA disposed of the houses, the owners purchased this block in the 1950s and sub-divided it between them. The Historic Houses Trust purchased the No. 1 house in 1993 and restored it, but to cover its costs, a small town house was constructed on the eastern boundary and the land for 140 was subdivided prior to the sale of the two residences. This is one of the demonstration houses financed by a GSDA shareholder, Sir William Elliot Johnson, MHR and Speaker of the House of Representatives. The design uses a 40ft (12.23m) square constructed of local sandstone with prominent corner piers. The house is orientated towards the harbour view with a bank of French windows leading to a portico and dramatic rounded windows set within radiating voussoirs on either side. The garage, constructed in 1965, was designed by Eric Nicholls. The present owners have restored many of the original features since 2006. The Grant House from the street in 2007. Financed by the GSDA shareholder and Melbourne theatre producer and manager, Julius Grant, this stone house is best known as the Griffins’ residence from 1925 to 1936. It was the centre of community activities during this period. Various owners have made additions to the house over the years, but the removal of earlier changes at the front by the present owners has reclaimed much of its charm. 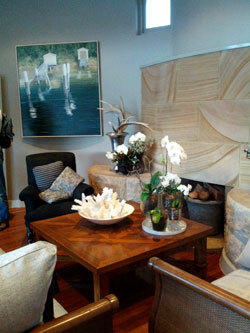 Eric Nicholls designed this two-storey house in 1940 his distinctive sandstone and pillar style for a private client. Although lacking the subtlety of the adjoining Griffin-designed houses, this residence contributes to the outstanding streetscape of this locality and is heritage listed on Willoughby Council’s local environmental plan (LEP). The Moon House with the Nicholls additions of the first floor, entry and garage. Built for the Melbourne businessman and GSDA shareholder Chin Wah Moon, this stone house was designed as a single-storey dwelling by Griffin and constructed in 1922. Eric Nicholls purchased the house in the 1930s and the family lived there for some years. Nicholls added the garage, stairwell and landscaping works, including the distinctive entry gate with its stone piers, in the 1940s and the second storey in 1950-52. The house retains its configuration of rooms and most of its features. The Moon House was assessed by the heritage architects Clive Lucas, Stapleton & Partners to be an outstanding example of Eric Nicholls’ architecture, and is one of four of his buildings rated as being of State significance. The eastern facade of the restored Cheong House in 2008. This stone house was financed by the Reverend Cheok Hong Cheong, a leader of the Chinese community in Australia and GSDA shareholder. 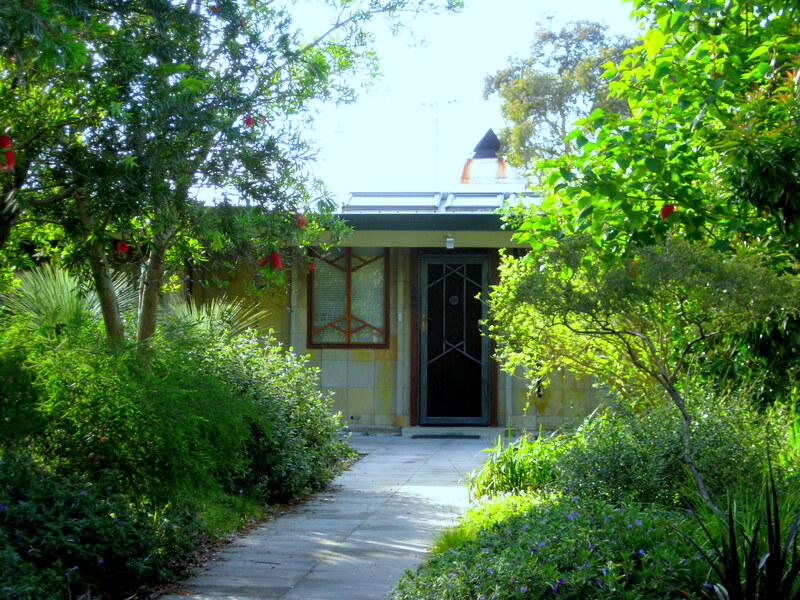 It is a small dwelling with an almost identical exterior to the King O’Malley house (see Castlecrag Private Hospital), but with a different orientation. This house was home to the German Jewish refugee Friedel Souhami for 56 years until her death on 12 October 1996 and remained in its original condition, except for a garage and laundry addition constructed in the late 1940s and early 1950s, the latter designed by Hugh Buhrich. New owners undertook extensive renovations in the early 2000s guided by heritage architect Scott Robertson and this work won Willoughby Council’s 2008 Heritage Award in the restoration category, the Australian Institute of Architects Heritage Architecture Award in 2008 in both the NSW Chapter and the national award in this category. The subsequent renovation of the Buhrich studio was highly commended by the judges for the 2010 Willoughby City Heritage Awards. The Griffin Memorial Fountain by the sculptor Bim Hilder on completion in 1965. Designed by Castlecrag sculpture Bim Hilder, this-fountain was erected on the traffic island at the intersection of Edinburgh Road and The Sortie Port to provide a prominent entry feature to the Griffin Estates. The plaque is inscribed ‘in recognition of the life and work of Walter Burley Griffin’. The Griffin Memorial Fountain at night in March 2006 following partial restoration by Willoughby City Council. It was officially opened by mayor Laurie McGinty on 23 October 1965 as a major feature of the celebrations of the Centenary of Willoughby Municipality. The Castlecrag Progress Association arranged public inspections of Griffin houses to raise funds for the fountain. It is listed on Willoughby Council’s heritage register and is regarded as one of Hilder’s two finest public art works. Cabarisha in the late 1930s. The additions had obliterated any remnants of the King O’Malley House. The house built for the prominent and colourful Federal politician and GSDA shareholder King O’Malley was the fifth of the Griffin-designed constructed in 1923. It was of similar design to the Cheong House, but with a different orientation. It was leased to Edgar Herbert who lived there with his family from early 1924 until 1927. O’Malley was a regular visitor during this period. Dr Edward Rivett purchased the house in 1927 and converted to a private hospital. In 1933 Rivett engaged Griffin to design extensions to provide for a 20-bed hospital, which he called Cabarisha after a legendary American Indian healer. In 1933 Eric Nicholls prepared the design for his first Castlecrag building, the Cabarisha Hospital nurses’ quarters at 6 The Battlement. Nicholls designed further additions to the hospital building in 1940 and there have been several additions and remodelling since then. Now the Castlecrag Private Hospital, the complex is operated by the Ramsay Health Care Group. The Felstead House from the south-east in the 1960s. Max Dupain photo courtesy Walter Burley Griffin Society. This residence constructed in Griffin’s patent knitlock bricks in 1924 for Theophilus Pyrie Felstead, a Melbourne-based businessman who traded extensively in the east, was the first private commission in Castlecrag. Constructed in pavilion form around a courtyard with pitched roof and wide eaves, the house has a different character from other Griffin houses in the suburb, resembling Griffin’s earlier ‘Prarie houses’. The central atrium provides access to all rooms which are larger than in other Griffin houses, while the knitlock walls have an umber-coloured sand finish. The Felsteads occupied the house until 1929, when it was bought by Edward Beeby, the son of the prominent NSW judge and former politician, Sir George Beeby. A solicitor, Edward had represented Walter in his legal conflicts with Melbourne-based GSDA shareholders during 1926 and in the 1928 Rivett court case. He had been drawn to Castlecrag by the Griffins’ ideas and the family, Edward, Ruby and their four children, became engaged with the Castlecrag community. Edward, however, abandoned his wife and family shortly afterwards, so Sir George stepped in to support his daughterin-law and grandchildren. Edward retained title to the property until September 1941, when it was transferred to his mother, Lady Helena Beeby. View of the Felstead House from Edinburgh Road, October 2011. Mrs Joyce Harrison, wife of architect and planner Peter Harrison, purchased the house in 1952. During their occupancy, the Harrisons took immense interest in the house and the work of the Griffins. When Peter was appointed Director and First Assistant Commissioner of the National Capital Development Authority in 1959 the family moved to Canberra and the Felstead House was sold. The Guy House photographed in 1965 by Max Dupain before the second storey was added. The living room with its columns and French doors is on the left with the second bedroom on the right. This small stone house, constructed in 1926, was designed by Griffin for Robert Guy, a freelance commercial artist, and his wife Elizabeth. The house is noted for its floor plan of interlocking squares symmetrically arranged about a diagonal axis. The main square is the living room, which is defined by columns with French doors between, while the free-standing fireplace divides it from the second bedroom. It is regarded as an outstanding example of Griffin’s planning, siting and design. A second storey addition was constructed in the late 1960s. View of Camelot from the street, June 2003. Regarded by many as Eric Nicholls’ finest building, this outstanding residential building was designed in 1938 for Guido Baracchi, one of Castlecrag’s most colourful identities. Baracchi had been an admirer and client of Griffin in Melbourne and he moved to Sydney in January 1937 with his partner, the Australian playwright and author Betty Roland. Griffin was in India at this time (he died there on 11 February 1937), so Nicholls was managing the GSDA and upholding the Griffins’ vision for the estate. Nicholls took the couple on a guided tour of the Castlecrag estate and in January they purchased a block of sloping land with a superb view, and they moved into the Creswick House nearby in April 1937.
pool replacing the former ‘play viewing area’ and the new residential annex in the background. Baracchi and Roland named their house Pangloss, after the character of this name in Voltaire’s Candide. The Hobbs family, which purchased the house in 1950, renamed the residence Camelot. The present owners, who purchased the house in 1974, have a deep respect for its design and social history. 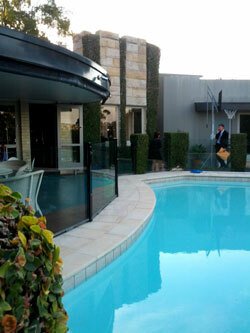 They have added a compact residential wing and a swimming pool located on the former forecourt lawn. There has been considerable expenditure on maintaining its features and the house is immaculately presented. View of the living room at 3 The Bastion. Acknowledgement: I am grateful to Bob and Jenny Wright for their assistance in documenting this tribute to Pangloss / Camelot. Built in 1926 on rocky and steep terrain, this was the first knitlock house with a flat roof, a feature that led to significant problems with leaks. The small rectangular house was orientated to gain advantage of the view and straddled the rocky ledge. The setting enabled easy access to the roof via a small ‘bridge’. There have been numerous alterations and additions to the house over the years and little of the original structure is visible from the street. This small knitlock house constructed in 1926 was the first of three Griffin-designed houses sited on top of the ridge in The Barbette with setbacks staggered to allow views past each other to Middle Harbour. The present owners have constructed a new residence below the ridge, leaving the Griffin house, which retains its original form, free from new rooms and services. It is accordingly one of the most intact of the Griffin houses, retaining its original door and windows, and most of the original joinery. Its view from the street has, however, been severely restricted by vegetation. Completed in 1929 for Roy and Beryl Wilson, this linear stone house is one of the most intriguing of Griffin’s Castlecrag houses. It features a sequential presentation of spaces with a central hall opening to an octagonal living room at the southern end with a massive stone fireplace. This room was often used for community concerts and play readings. A small self-contained dwelling designed by architect Clive Buhrich was subsequently constructed beyond the house at a lower level. Frank and Anice Duncan entertain in the garden of their house circa 1940. Constructed in 1934 for Frank and Anice Duncan, this was the last Griffin house constructed in Castlecrag and completed the trio of his houses on the ridge top of The Barbette. A minimalist house of just 7 metres square, it combined knitlock and stone construction and achieved a wonderful demonstration of the Griffins philosophy of living in harmony with nature. Set at the rear of the allotment, French doors were used to integrate the house with its surroundings. Anice Duncan developed the garden predominantly with indigenous plants and a new bedroom designed by Eva Buhrich was added in 1943. New owners erected a substantial addition in front of the original house in the 1990s, blocking it from the public vista. Cappy and Margo Deans stand in the open section of the sleep-out of their house at 170 Edinburgh Road, circa 1946. A view of the EA Deans House at 170 Edinburgh Road showing its relationship with the rugged topography, circa 1950. Initially there was an open verandah at the front, but this was enclosed by the Deans family, as was the open sleep-out off the bedrooms below. Extensive modifications have subsequently been made to the street level facade. Designed by the modernist architect Alex Popov- The Griffinhouse won the 1990 Robin Boyd Award, the highest national architecture prize for residential work. The judges as described it: ‘a reverent tribute to Griffin … but a beautiful and liveable building, which responds to the needs of the client and the constraints of the site‘. The house comprises three pavilions (living, dining and sleeping) constructed of deeply contorted brickwork and connected by a columned corridor around a pool and terraces. The Griffin legacy is referenced by areas of sandstone walls as part of the facade. The Fishwick House and garden showing the eastern balanced picture window. This stone house is the grandest and most celebrated of the Griffin Castlecrag residences, having been constructed for a wealthy client (Thomas Fishwick, the representative of John Fowler & Company in Australia) in 1929. Entry is through a narrow passage between the garage and the kitchen courtyard, opening into a columned room that receives light through a ‘window’ in the fireplace chimney. The fireplace divides the living room, which features a balanced picture window that offers grand views to Middle Harbour and The Spit. The dining room on the south side had a fish pond inserted in the ceiling. The entry to the Fishwick House viewed from the street. The first floor contains bedrooms, bathrooms and sun decks over ground floor rooms. Nisson Leonard-Kanevsky, the managing director of the Reverberatory Incinerator & Engineering Company, and his family lived here from 1931 to 1937 when he was supervising the construction of the company’s municipal incinerators, including the Willoughby Municipal Incinerator. The house is one of the most intact of the Griffin-houses and the present owners have restored the interior finishes to their original glory. The Moriarty House photographed in October 2011. The additions are on the right. Designed by Eric Nicholls for Stan Moriarty in 1940 and built in 1942, this house is regarded as an outstanding example of his architecture. It embraces the then contemporary vogue for smooth rendered surfaces and curvilinear lines, combining elements of Moderne with Nicholls’ anthroposophical influences to create a distinctive style. Additions made during renovations in the 1990s are in a different style to distinguish them from the original work. The Moriarty House was assessed by the heritage architects Clive Lucas, Stapleton & Partners to be an outstanding example of Eric Nicholls’ architecture, being one of four Nicholls buildings rated as being of State significance. Designed by Peter Muller in 1953 for Robert Audette, this landmark house is regarded as one of finest works by modern post-war Australian architects. There are Frank Lloyd Wright influences, particularly in the strong horizontal forms and exposed timber frames, but the organic style was also influenced by a visit to Japan. Other features are the flatroofs with splayed timber fascias and the snooted brickwork with oozing mortar between the bricks to add texture. Additions and alterations have been made over the years, but Council has required an endorsement by Muller for these changes. A key feature of the Griffin Conservation Area is the network of walkways and reserves behind the residences. Griffin’s plan for the model suburb involved 20 per cent of the land at Castlecrag being set aside for parkland, considerably more than that required by the local council at the time. The reserves, some for active recreational use, buy most for passive, were linked together by a network of walkways, providing the community with ample space for recreation and bushwalking while retaining the bushland setting. In 1940, Marion Griffin gifted the open space of the reserves and walkways, including four kilometres of foreshore land, to Willoughby Municipal Council under a Deed of Trust. During World War II and the following decades much of the reserve and walkway system fell into disrepair and there was considerable encroachment onto public land by residents. In 1997, Willoughby City Council commissioned consultants to prepare a Plan of Management for the Griffin reserves and walkways. It concluded that the open space management system of Castlecrag is significant in Australia and other countries as an innovative demonstration of the protection of the natural landscape character and the provision of open space in a garden suburb. It set out management principles for the overall system and provided action plans for each reserve, while a Griffin Reserves Advisory Group was established to facility community inputs into the management of the reserves. Cortile Reserve near the shops was originally conceived as an active recreational area and this function continues, with tennis courts and a childrens’ playground being located there. Its management plan has recently been revised and extensive plantings have been undertaken in accordance with this. Casement Reserve and the walkways that link The Barbette to The Redoubt and walkways to the shops have received attention from a local bush care group over an extended period. The remnants of Kunzea ambigua in this reserve have been rejuvenated by controlled burning. A new walkway has been established that enables walkers to explore the attractive rainforest of Watergate Reserve. Turrent Reserve opens on to The Rampart and is also reached by an outstanding Griffin walkway running from The Postern to The Parapet. This offers excellent views over neighbouring gardens and the escarpment to Northbridge and Middle Harbour. The reserve features uniquely linked sandstone escarpment and rock platforms that offer vistas over Northbridge. Particular attention has been given by Council contractors to restoring the linked Embrasure and Gargoyle Reserves between Edinburgh Road and The Bulwark. Here the vegetation had become overgrown and access was restricted by encroachments. Access is now available via rebuilt stone stairways and the walkway links though to the Oriel Reserve. This reserve formed a pivotal function in the Griffin open space system connecting five pedestrian access ways and linking lineal reserves beneath a major sandstone escarpment complex. The path from The Citadel to The Bastian via Oriel Reserve provides pedestrian access to the Haven Amphitheatre. A Doric temple erected at the Haven Valley Scenic Theatre for a Greek tragedy in the mid-1930s. For Walter Burley and Marion Mahony Griffin the beauty of Sydney Harbour provided the inspiration for the model garden suburbs they set out to develop in 1920. Backed by Melbourne businessmen, politicians and personal associates, the Griffins formed the Greater Sydney Development Association (GSDA) in 1920 as their vehicle for realising the new dream. Within a few months the GSDA had purchased 263 hectares of land on three Middle Harbour peninsulas that were to become the suburbs of Castlecrag, Middle Cove and Castle Cove. Marion had limited involvement in architectural matters during their Castlecrag years, instead pouring her energy into the making of community life at Castlecrag. She was the driving force behind the establishment of the Haven Valley Scenic Theatre, an open-air theatre developed in a natural glen beside the waters of Middle Harbour. Bim Hilder led the team of local volunteers who constructed the theatre using local sandstone to form the tiered seats. Marion was involved in production, set and costume design for more than 12 plays at the theatre between 1930 and 1936. The productions ceased during the war years and the site became overgrown and strewn with debris. When the community of Castlecrag came together to celebrate its Griffin Heritage as part of Sydney’s American Bicentennial celebrations in 1976, it took on the task of restoring the theatre. The Play Marion’s Gift by Lindy Batterham was performed at The Haven Amphitheatre on 14 November 1993 to celebrate the 60th Anniversary of Marion Mahony Griffin giving the Title Deeds of the amphitheatre and the Castle Haven Reserve foreshore to Willoughby Council as public land. As its contribution to that event, the community chose to clear and resurrect the amphitheatre site with a new stage and changing facilities designed by local architect Robert Sheldon. It reopened as The Haven Amphitheatre for the Castlecrag Heritage Festival in April 1976 with a three week season of Oscar Wilde’s Salome directed by Howard Rubie. Since that very successful reopening, the amphitheatre has presented many theatrical and musical events including performances by stars of the Australian Opera, the Willoughby Symphony Orchestra, jazz concerts, poetry readings, plays, community events, the occasional wedding, arties and pantomimes and the now legendary Carols on Christmas Eve. 1 National Trust of Australia (NSW), ‘Classification Report, Camelot formerly Pangloss, Castlecrag’, August 2004, p 5. 2 Roland, Betty, The Eye of the Beholder. Sydney, Hale & Iremonger, 1984, p 154. 3 Betty Roland, ‘Where’s Pearl Harbour’, in Castlecrag, Castlecrag Infants School Club, 1972, p 52. 4 National Trust of Australia (NSW), ‘Classification Report’, as above, pp 1-2. 5 Margo Watson (nee Deans), interview at Castlecrag, 3 October 2012. 6 ‘The Architecture of Eric M Nicholls in the Willoughby City Council Area’. Monograph by Clive Lucas, Stapleton & Partners, 2004, pp 34-36.